I have two kids, Arthur (6 years old) and Adam (5 years old). I use to tell them stories since they were born. I have to create a new one every evening. It's a very good exercice of imagination and it seems they like this. When they were younger, it was quite easy but now it's more and more complicated. They sometimes complain about the nonsenses or they simply want to change the story. They asked me to be part of the adventures too, they wanted to be the heroes. Few years ago, I used puppets or toys, now they want me to be a storyteller. So, my stories became more and more "interactive". I started to ask them what their characters wanted to do. Being involved in plot is more entertaining and kids reactions are sometimes very strange or funny (or weird ^^). They're learning to count and read, so I decided to change the rules. They usually have to find the answers to riddles. Basic mathematic "enigmas", like additions or multiplications for example. They learn faster when they have fun. I'm a RPG player since more than 25 years, so I have plenty of 20, 10, 8, 6 or 4 faced dices. We started to used some dices in the stories in order to add a little bit of challenge and a bit of randomness. I was quite surpised when they created their characters. They didn't want to play kids but warriors with giant swords and full plate armors. Yes, I know it's not SO surprising. My kids don't watch TV, they never had weapon toys (but kids can create weapons with nearly everything) , they are not familiar with violence. I didn't expect they would choose to play warriors. But when you look at your kids, playing with their action figures, it's very often about violence. They are fighting imginary vilains, making battle noises and speaking (well, shouting) with their characters voices. I'm not sure it's because they are boys, little girls can be very violent too; perhaps in a different way. But it's another topic. I'm trying to avoid violence in my stories, even if they asking for fights and battles. I think I found a good solution ... They never "kill" living creatures or human beings. The enemies are creatures made of ice, fire, stone, ... Elemental creatures, for example. - Don't play for too long : Half an hour is a good timing. - Don't forget it's bedtime stories : They have to sleep after the story, so try to find a quiet and peaceful end. - Don't forget they are kids : The sories have to be moral. They are good characters, don't let them do weird things even if they really want and explain to them why they cannot do that. Rewarding the good actions, push them to help each others. - Have fun : Try to imagine fun stories. Helping Santa Claus for Xmas, fighting the giant creature made of snot, finding a solution for the invasion of the carnivores snails, ... A little bit strange for heroic-fantasy based stories ? Who cares ? They don't ...Don't be too serious, it's only entertainment. You can try scary stories too, some kids really enjoy that. - Try to make them learn in the same time : Let them do the additions and the subtractions, let them read their character sheets, use complicated words and expalin their meanings, describe the scenes and teach them a little bit of history ("Do you know why Lords had castles ?"). As I said, children learn faster when they have fun. - Find the good mood : Overact, change your voice for each different characters, make noises, describe the scenes ... Storytelling is not so easy, try to tell an interesting story. - Kids have different tastes : Space adventures, heroic-fantasy, superheroes, ... Ask them what they want. - Playing with a single kids could be boring : Ask to your wife, your husband, your friend to play a character too ... We spend only few hours with our kids every day, having fun with all his family is good for a child. It's quite difficult to explain you spend so many time to paint for clients, friends or family and not for them. They didn't want a simple sketch, a fast done doodle; they wanted a real picture. I told them painting is my job, I'm earning money for my paintings; they answered me they had money (about 10 euros; a lot of centimes coins ...). They won (I didn't take their money). So here's the making of the picture of my second son's character, Adam. It turned into a funny experience. I told them they are now my clients and my art directors. So I had to paint what they want and they had to help me and guide me. So, my son, what do you want ? A warrior with a big armor and a biiiiiiig sword, ok ... But I need more details. In wich style ? What kind of armor ? A basic sword or a magic one ? Of course, he dunno. It seems an 5 years old art director act like real ones. I had to help him a little bit for the beginning. We created a background for his character. He's a knight, he came from a very cold country, he fights with a magical sword, he likes ice creams (^o^). Then, all became very easy. 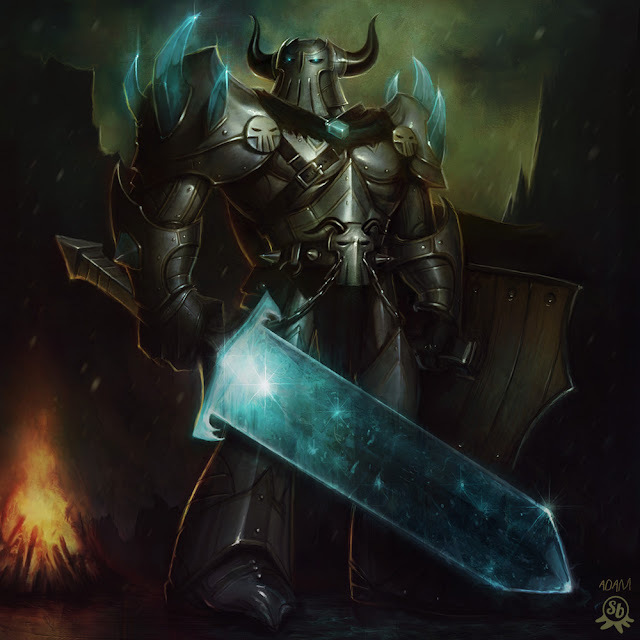 A grey or blue armor with crytal or ice spikes, a magic sword made of ice, an horned helmet (like vikings) and skulls ... A lot of skulls. I dunno why, he just wanted skulls ... probably because it's more "badass". I asked him to draw him first, just to have a reference. Unfortunately, we lost this picture. I will show you the one my other son did for his character in the second part of this article. We changed the helmet and the horns several times. It finally looks like the helmet of Zorg, from Toy Story. Kids have their own references, you have to deal with it. I didn't expected him to be so ... picky. He asked me for cartoon proportions, something like a character from the animated serie of Batman. I told him it was a good idea, it would make more sense with the very big sword. Once again, I did a lot of changes. I wasn't convinced by the first versions of the sword. We tried several shapes, sizes and renderings. Finally, I had to add skulls. He really wanted skulls on the armor. I was very surpised by his reactions during the process. He sometimes had opinions about the colors or the lights for example. It's very strange to hear your 5 years old son telling you : "yes, it's better like that". For the first time in my life, my son looked at one of my pictures and said "Wow! I love it !". I know it could sounds a little bit ridiculous but I think it's probably the best career achievement ever. I didn't do a lot of screenshots. I used my "concept art" style so I didn't spend a lot of time on it, about 5 or 6 hours. It looks less clean than my usual stuff. A lot of textured brushes, standard ones and some Ditlev brushes. I did a lot of colors and contrast adjutments, perhaps too much. In the next part, I will speak about the character creation of my other son, Arthur.